The seasons seem to roll around faster than ever, and earlier this month it was time again to put our fish protection in place for the adult salmon that are about to start running up the river to spawn. 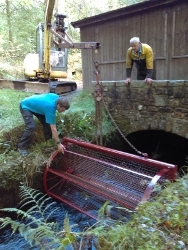 Often folk ask us how we fit the fish wheel in place and the picture illustrates how with the help of the digger we can safely fit the wheel in its channels in the tail race without putting anyone at risk. It is also pleasing to know that a few weeks after fitting the fish wheel Miles has already seen salmon not only above our powerhouse but also above our weir this season.